As if the oral effects of bad breath, stained teeth, loss of taste and smell, mouth (canker) sores, failure of dental implants, and oral cancer were not enough, tobacco use is implicated in the gum recession, bone loss, and tooth loss associ­ated with periodontal (gum) disease. Tobacco use is one of the most significant risk factors in the development and progression of gum disease and oral cancers. It is not just having the smoke in your mouth that affects the gums. 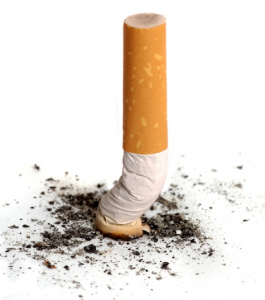 Nicotine actually makes it easier for the bacteria that are normally in your mouth to lead to inflammation. Tobacco decreases your ability to fight infection, interferes with healing, and makes you more likely to have serious gum disease that results in tooth loss. Gum disease can occur without you even knowing it. Ongoing gum disease is strongly linked with an increased risk for heart disease and other serious diseases. Smokeless tobacco is also associated with gum disease, oral cancer, increased tooth decay and bad breath. Smokeless tobacco like “chew” is a constant irritation to the spot in the mouth where it is placed, causing permanent damage to the gum tissue. It can also damage the supporting bone structure. The injured gums pull away from the teeth, exposing root surfaces and leaving teeth sensitive to hot and cold. Erosion of bone support leads to teeth that become loose and may be permanently lost. Regardless if you smoke or chew any type of tobacco, you are putting yourself at risk for gum disease, cancer, heart disease and other serious inflammatory diseases. If you would like help to quit smoking, please see your physician or contact the Canadian Cancer Society or click on this link to find helpful resources.